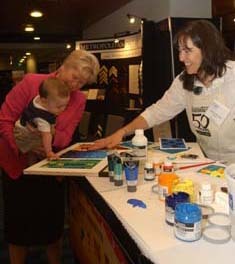 The 98th Annual Conference will take place February 10–13, 2010, in Chicago, Illinois, the first time since 2001. 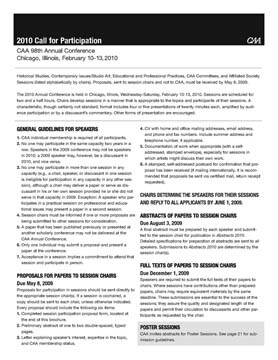 Listing more than 120 sessions, the 2010 Call for Participation, which you can download now as a PDF, will arrive in the mailboxes of all individual and institutional CAA members in March 2009. This twenty-four-page publication describes many of next year’s panels and presentations. CAA and session chairs invite your participation: please follow the instructions in the booklet to submit a proposal for a paper or presentation. This publication also includes a call for Poster Session proposals and describes the Open Forms sessions. In addition to attending and participating in the wide-ranging panels on art history, studio art, contemporary issues, and professional and educational practices, CAA expects participation from many area schools, museums, galleries, and other art institutions. The Hyatt Regency Chicago is the conference hotel, holding most sessions and panels, Career Services and the Book and Trade Fair, receptions and special events, and more. Deadline: May 8, 2009. Once again, CAA is publishing an official Annual Conference blog in order to chronicle the event’s diverse experiences, points of view, and opinions. Six bloggers, selected from among the CAA membership, will be writing daily—even hourly—on Los Angeles conference events. Christopher Howard, CAA managing editor, will moderate and post images. The 2009 bloggers are: Katie Anania, a graduate student in art history at the University of Texas at Austin; Beth Harris, director of digital learning at the Museum of Modern Art in New York; Micol Hebron, a California-based video and performance artist and an assistant professor of art at Chapman University; Benjamin Lima, a doctoral student at Yale University; Ed Schad, a Los Angeles–based writer and a curatorial associate for the Broad Art Foundation; and Steven Zucker, dean of the School of Graduate Studies at the Fashion Institute of Technology, State University of New York. Read their full biographies on the blog. Regular sessions and ARTspace happenings, Career Services and the Book and Trade Fair, exhibition openings and special events—anything and everything is game for the CAA conference blog! On Tuesday, President Barack Obama signed the American Recovery and Reinvestment Act, passed by Congress late last week. The $787 billion stimulus bill includes considerable appropriations for the National Endowment for the Arts ($50 million for a federal agency with a $245 million budget for the current fiscal year) and Smithsonian Institution ($25 million, but cut from the House’s original request of $150 million). Language that, in the Senate version of the act, would have excluded museums, theaters, and arts centers from receiving federal funds was removed from the final legislation. Helen Stoilas from the Art Newspaper and Robin Pogrebin at the New York Times have also reported on the arts portion of the stimulus bill. The New York Times has published a full breakdown of the $787 billion, although arts and education funding don’t appear in standalone categories. However, Doug Lederman at Inside Higher Ed once again lists higher-education allotments in the House and Senate bills, as well as amounts in the final compromise that was approved by President Obama. CAA has announced the list of exhibitors who will be present in Los Angeles for this year’s Book and Trade Fair. Taking place at the Los Angeles Convention Center during the 97th Annual Conference, the Book and Trade Fair hosts more than one hundred major college and university publishers, leading trade publishers, and trend-setting independent presses. The largest national and international art-materials manufacturers and distributors, as well as highly specialized companies with unique products for studio artists, will show their products and wares. Also on hand are a handful of contemporary art journals. The fair continues to attract a wide array of diverse organizations providing professional services to the visual arts, including programs of advanced study, specialized associations, advanced-degree programs, and independent exhibition services. At the CAA booth, you can purchase copies of the highly anticipated directories of graduate programs in the arts: Graduate Programs in Art History and Graduate Programs in the Visual Arts. Stop by to browse these publications, talk with CAA staff members, and learn more about CAA’s programs and services. The Book and Trade Fair in Los Angeles is open for three days: Thursday, February 26, and Friday, February 27, 9:00 AM–6:00 PM, and Saturday, February 28, 9:00 AM–2:30 PM. The 2009 sponsors are ARTstor, Blick Artist Materials, Prestel Publishing, Saskia Ltd./Scholars Resource, the School of Visual Arts, and SlideRoom. The Roski School of Fine Arts at the University of Southern California (USC) is hosting the 2009 CAA Regional MFA Exhibition, which will showcase the unique, diverse community of young artists in the Southern California region. Held in the Helen Lindhurst Fine Arts Gallery and the Gayle and Ed Roski MFA Gallery, the exhibition will be on view February 24–28, 2009. The reception for the artists and CAA conference attendees takes place in Watt Hall 104 from 6:00 to 8:00 PM on Friday, February 27. After the MFA opening reception, stick around USC for a celebration and special viewing of Looking into Andy Warhol’s Photographic Practice at the USC Fisher Museum of Art. Yesterday the US Senate passed its version of an $838 billion stimulus bill, entitled the American Recovery and Reinvestment Act, with a 61 to 37 vote. The legislation included the Coburn Amendment, which eliminated a $50 million provision for the National Endowment for the Arts that was included in the House of Representatives’ bill. The amendment, voted on last week, passed 73 to 24. The Washington Post lists how senators voted on the American Recovery and Reinvestment Act. 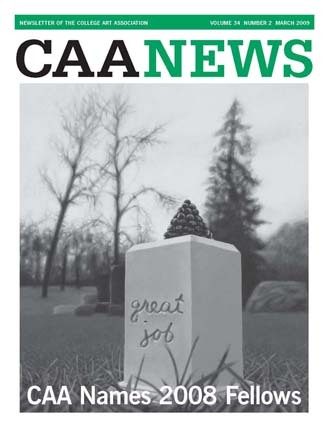 CAA encourages you to show your approval or disapproval to your congressional representatives, using Americans for the Arts’ Capwiz feature to send a customized letter. Yesterday the US Senate passed its version of an $838 billion stimulus bill, entitled the American Recovery and Reinvestment Act, with a 61 to 37 vote. The legislation included the Coburn Amendment, which eliminated a $50 millionprovision for the National Endowment for the Arts that was included in the House of Representatives’ bill. The amendment, voted on last week, passed 73 to 24.